DOS exists to create better lives. 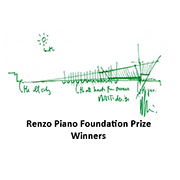 Our raison d’être is to be the leading designers of social change in the architectural industry creating a lasting legacy for better living around the world. We look at architecture from the perspective of the lives it supports and impacts upon, designing homogenous solutions that always consider the needs of the individual and those of the wider community. 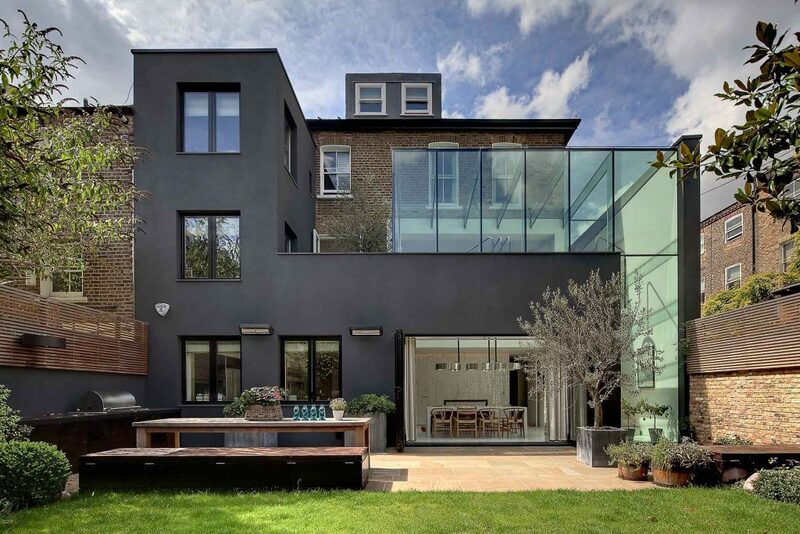 DOS Architects turned two classic Victorian terraces in Brook Green, London, into one outstanding, modern family home. Bright and spacious, an ambitious glass box rear extension creates a double-height void connecting the kitchen and dining room on the lower floor to the rest of the house. The glass box is flanked by a cantilevered shear wall, realigning the house on a north-south axis. Material contrasts create a visually exciting contrast between indoor and outdoor spaces. Dos Architects turned a potentially straightforward extension into an exciting, award-winning piece of architecture. The brief was to add a bedroom and increase the volume of a beautiful, Grade II listed Georgian terraced home in Islington, London. 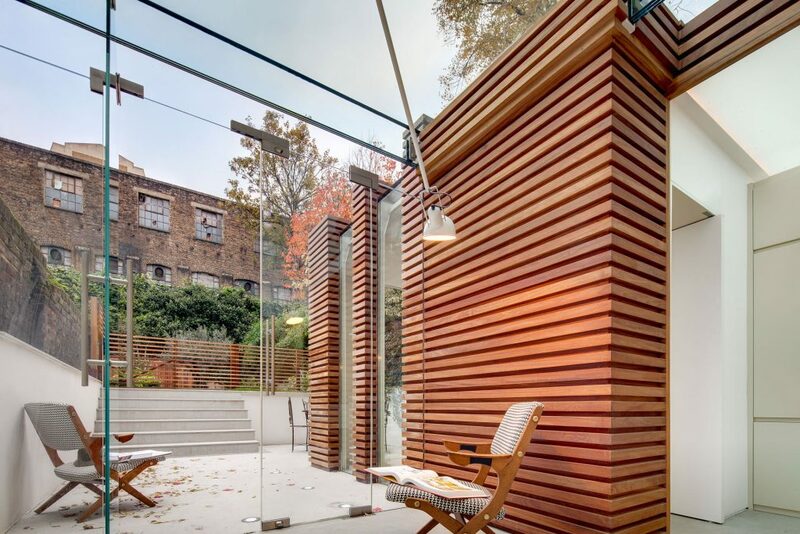 Focusing on a wooden, origami-like box of beautiful Iroko wood increased the natural light, connecting the garden to the home. Stone flagging also creates a seamless transition from indoors to out, creating a space that is fresh, light and airy while retaining an essential warmth. 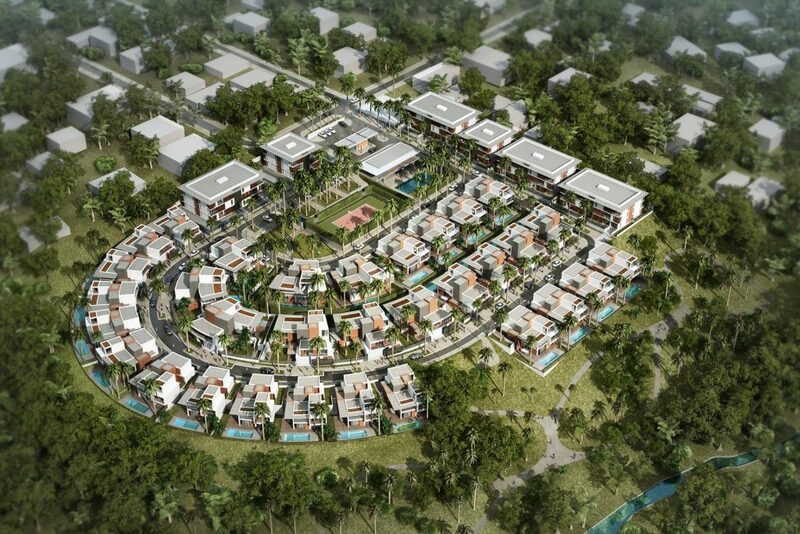 Located in the upmarket hub of Cocody in Abidjan, Ivory Coast, Deux Plateaux is an entirely new 47.600sqm development for an integrated, sustainable and inspiring living; a stylish community with different homes for different needs; including 36 apartments, 24 houses and 8 villas. We designed the complex to include ample shared facilities – from a tennis court and swimming pool to fitness centre and landscaped gardens. We succeeded in designing a community for a blossoming Ivorian middle class, inspired by west African modernist architecture and the lush green environment. 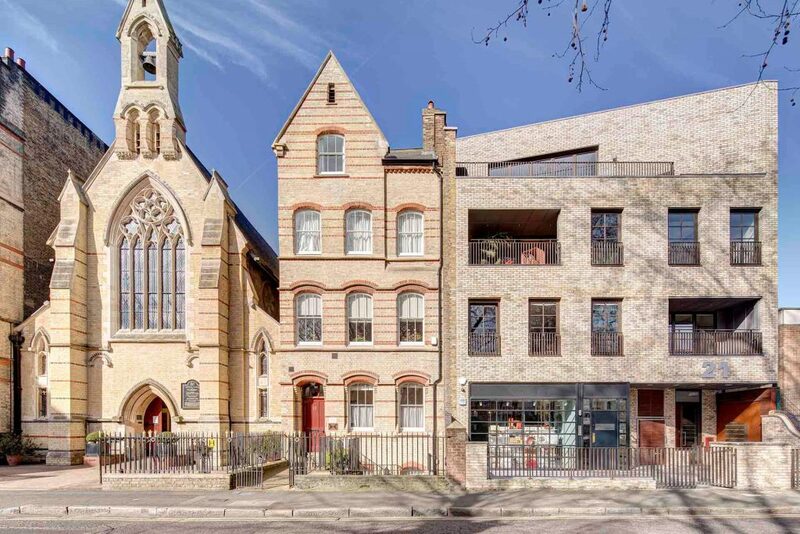 Nestled in the heart of Shoreditch, London, in a conservation area with tight restrictions, DOS Architects was given the green light to rebuild this corner of the iconic Art Square next to the classic, Pugin-designed St Monica’s Church and Priory. Ours is a simple, clean, confident structure, replicating the cladding materials, height lines and rhythms of the neighbouring facades. The building centres around a large, art gallery on the ground floor with a range of six 2 and 3-bedroom apartments above. 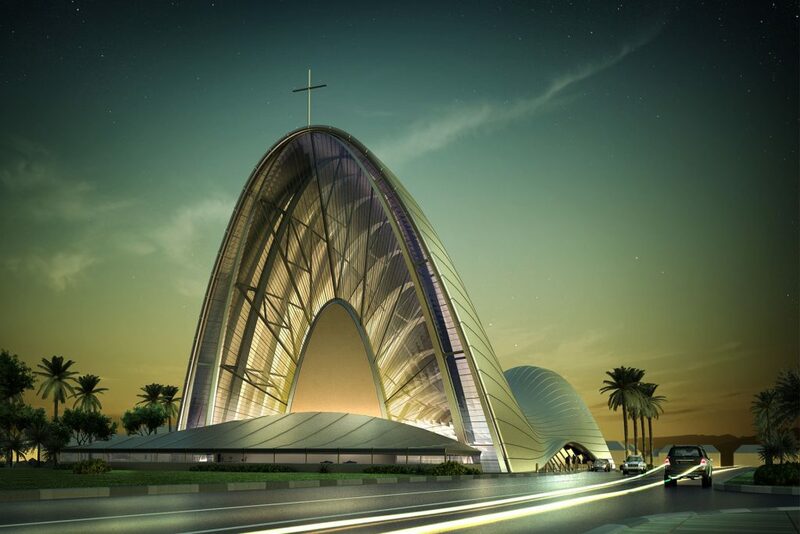 Dos Architects designed this Church for the Catholic community of Lagos, Nigeria, to become an iconic part of the city-scape: one large, seemingly floating arch to be enjoyed by all. Based on the traditional principles of church design, the prayer spaces were designed to be awe-inspiring as well as comfortable for quiet contemplation, all with views onto the main altar, while impressive glazed facades on both the east and western axis provide natural light and emphasize the height and scale of both areas of worship. Part of a larger, high-end development in a newly-developed part of Muscat in Oman, Dos designed buildings of luxurious and modern housing while retaining traditional design elements to reflect the lifestyle and environment. 104 apartments, including 9 penthouses, are set in two blocks and include ample green areas and swimming pool, parking and retail spaces on the ground floor. Internal layouts of the apartments are based on local needs, with big skylight cores to gain natural light and air. 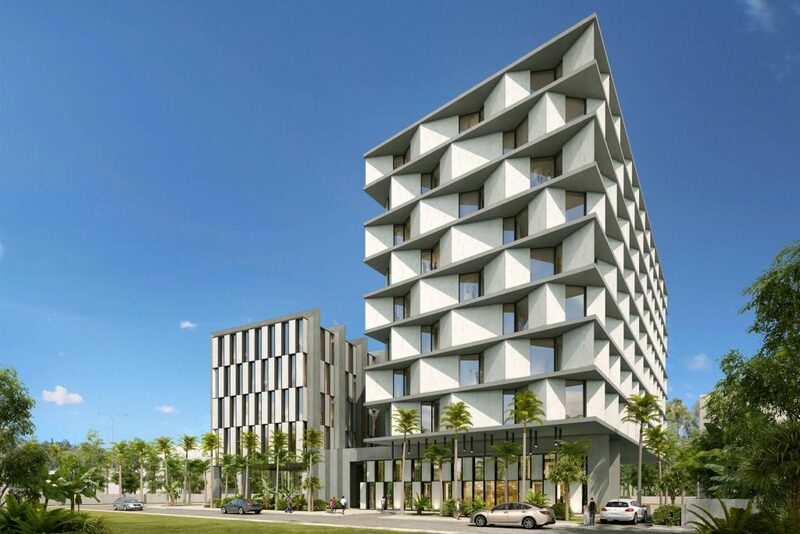 Dos Architects designed the first African Radisson RED hotel in Accra, Ghana, inspired by the modernist west African designs which have inspired so many the world over. This Accra hotel, locating in the bustling district of Osu, features an expressive façade to generate dynamic, changing shadows throughout the day, which is then balanced by the more sober façade of the neighbouring office block Dos designed to create a separate but parallel identity for both. 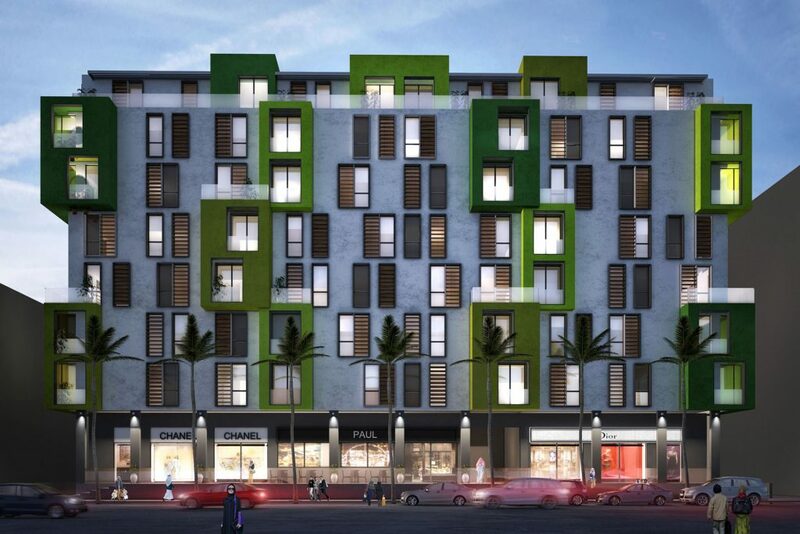 Dos Architects’ design for this building in the Kazanchis district Addis Abbaba, Ethiopia, succeeded in creating an arresting and exciting building to reflect the vibrant development and regeneration of one of the oldest parts of the city. 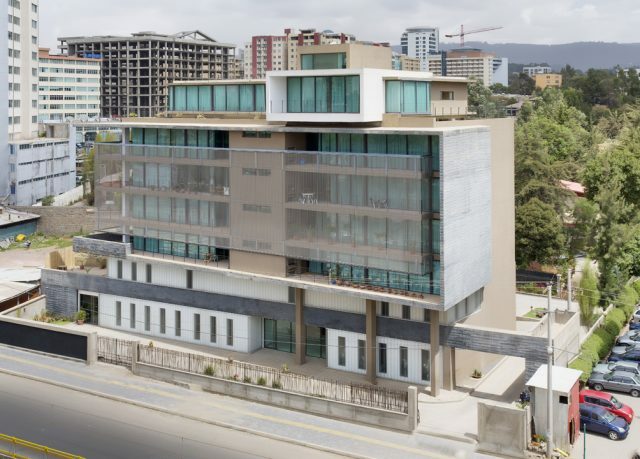 Designed in conjunction with Koffi & Diabate, based in Ivory Coast, this 8-storey building consists of a 2-storey gym and spa, with eight apartments and a spectacular penthouse apartment on the top floor. 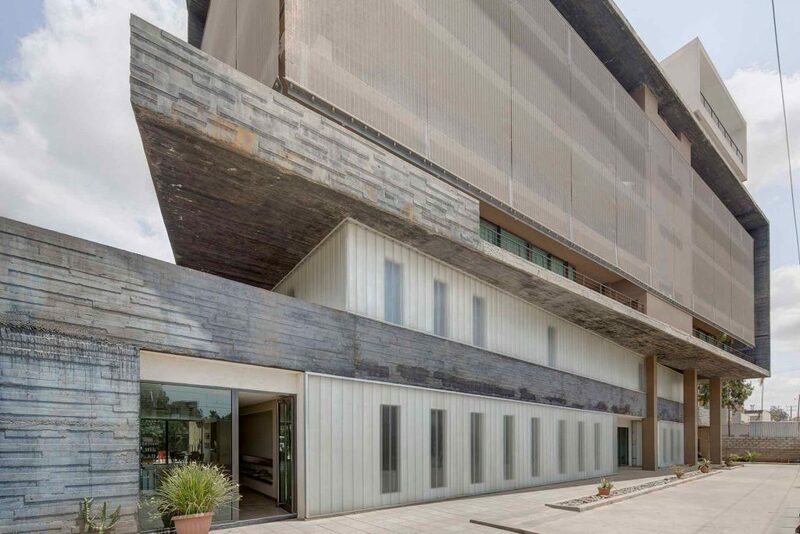 Featuring a dramatic overhang shadowing the glazed façade, it is the first building of its kind in the city. Our brief for this beautiful Georgian Grade II listed home in Notting Hill, London, was to update it while keeping its original quirks and thus creating the perfect family home – a real labour of love for Dos Architects. Originally built by a renowned artist, natural light is at the heart of this house, and thus we continued with this blueprint, creating an ideal backdrop for a truly spectacular art collection. Thoughtful planning meant we were able to alter the interior ceiling heights and update lay-out and technology throughout. 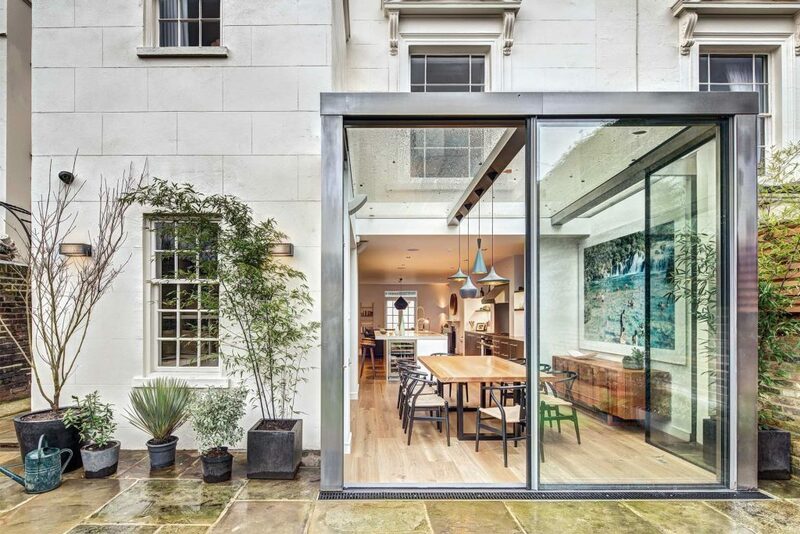 In Brook Green, London, Dos Architects created an interior space that brings freshness and light into the lower ground floor extension, creating a space that our clients’ wanted to be stylish and beautiful – but welcoming for the whole family. Joining two Victorian terraced homes together meant that there was ample space to keep bedrooms and living areas spacious, while maintaining a welcoming warmth through their own unfussy, relaxed style. We kept many of the original features of the house within the interior, while keeping the ‘glass box’ extension as a stand-alone architectural feature to set the tone for the whole home. For this Grade II listed, Victorian semi-detached home in Little Venice, London, Dos Architects added a rear extension, opening up the spaces for more natural light. 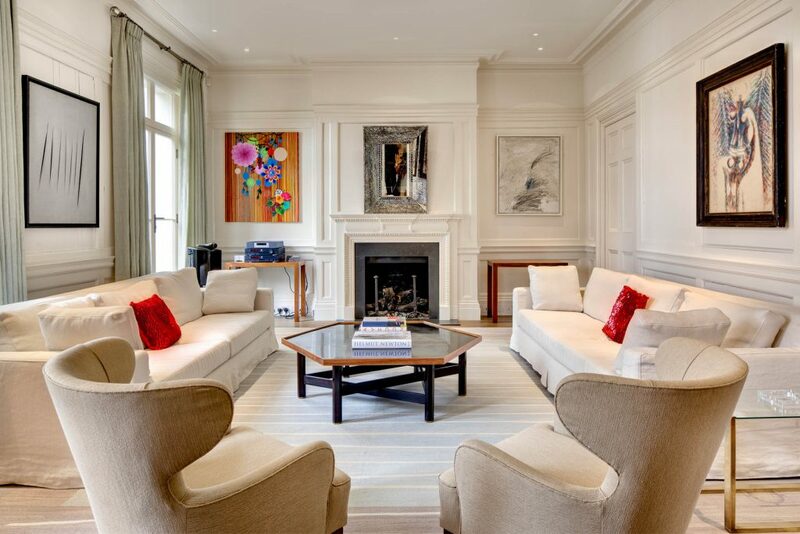 Here we cemented our reputation for success with architecturally sensitive buildings, updating old London splendour for a sumptuous, modern family home. Highlighting the eclectic style of our clients, we seamlessly created an almost industrial-look extension of high-tech stainless steel frame with glass inserts, with contemporary concrete worktops in the kitchen and a timeless classic style in the living, bedrooms and bathroom. For this Victorian semi-detached house in leafy Barnes, south-west London, Dos Architects kept the period feel of the house, while allowing their creative clients’ eclectic taste to shine. 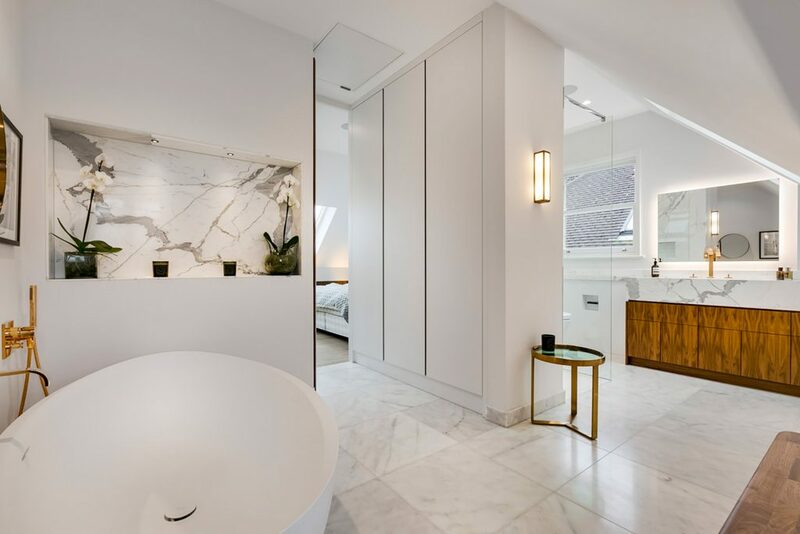 In this way, ultra-sleek and modern sit alongside period seamlessly, from the Stanley Kubrick-esque dazzling bathroom adjoining the master bedroom, to the more classic London living and dining rooms. Unique features include the bespoke wine cellar incorporated into the kitchen wall, polished concrete floors and the use of marble, wood and steel in the kitchen. 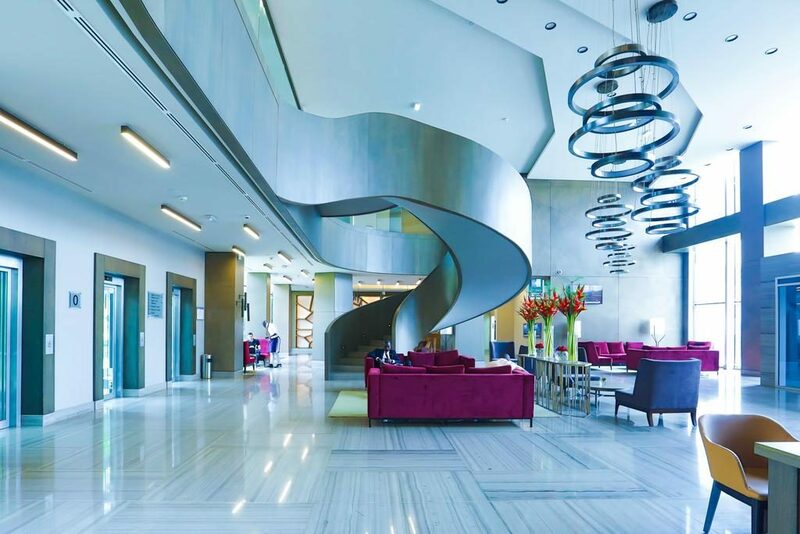 Our clients wanted openness and transparency, combining their desire for cutting-edge technology with a love of clean, luxurious designs, while respecting the traditional Gothic details of this iconic London Notting Hill building. We created the whole apartment to be centred around a large double-height, light-filled space framed by spectacular arched windows. The interiors and features highlight, rather than compete with the beauty of the church: thus the cantilevered glass staircase and glass-walled master bathroom sit perfectly next to the Gothic arched windows. DOS Architects created the ultimate office space for creative agency MAD London, redesigning the top two floors of an industrial building on Old Street, London. Preserving the industrial character of the building, we added warmth and modernity in the bespoke joinery, finishes and lighting. Designing all the inbuilt furniture, we used a combination of exposed plywood with high gloss white lacquer for the large central desk, solid Iroko wood with black, powder-coated steel for other desks and shelves, and rich grey upholstery blends to create the stylish inbuilt sofa in the entrance lobby. 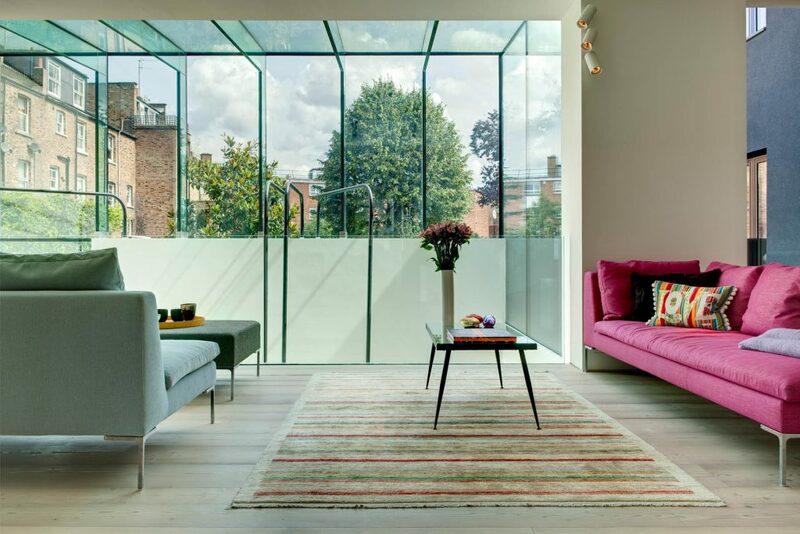 Dos Architects created a beautiful family home in this Grade II listed house in the heart of London’s Notting Hill. We designed a glass-encased staircase (who says child-friendly can’t be stylish?!) wrapped around a new, double-height interior space to open up the heart of the home. The new extension includes frameless folding doors, a glass ceiling to maximise natural light and a new first floor terrace. Totally remodelled throughout with our clients fresh, contemporary style, the clean, modern finishes truly complement the backdrop of this classic Georgian townhouse. 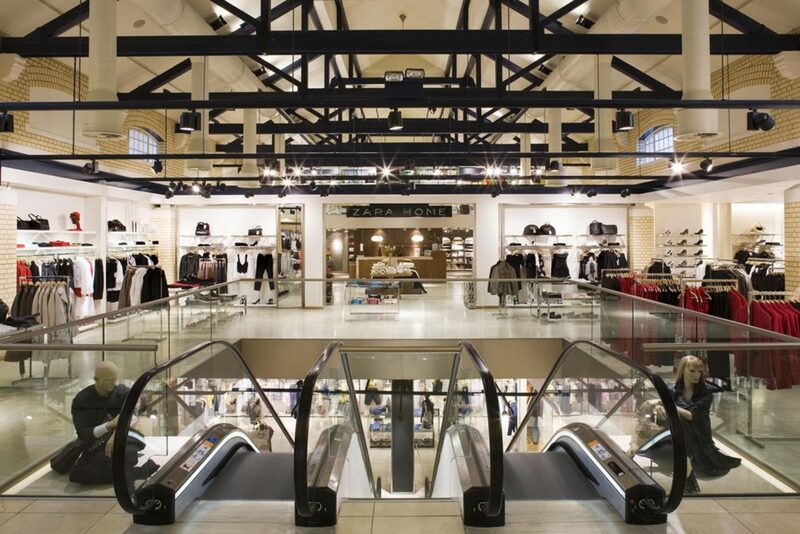 This Zara in Oxford Street, London is perhaps the most daring, stand-out Zara shop in the world, it boasts its own unique interior fit-out by renowned interior designer Elsa Urquijo. 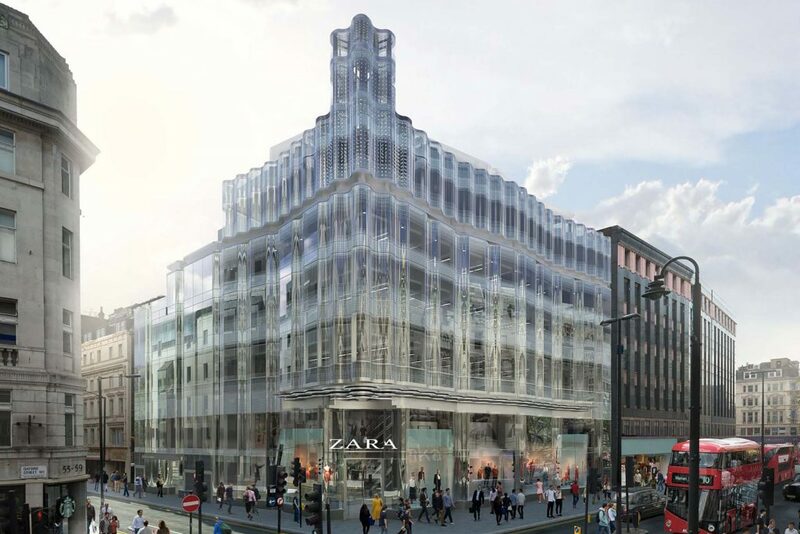 In this Zara in Westfield Stratford, Dos Management had to ensure a speedy turnover, working in conjunction with the Westfield Group landlords to achieve this. 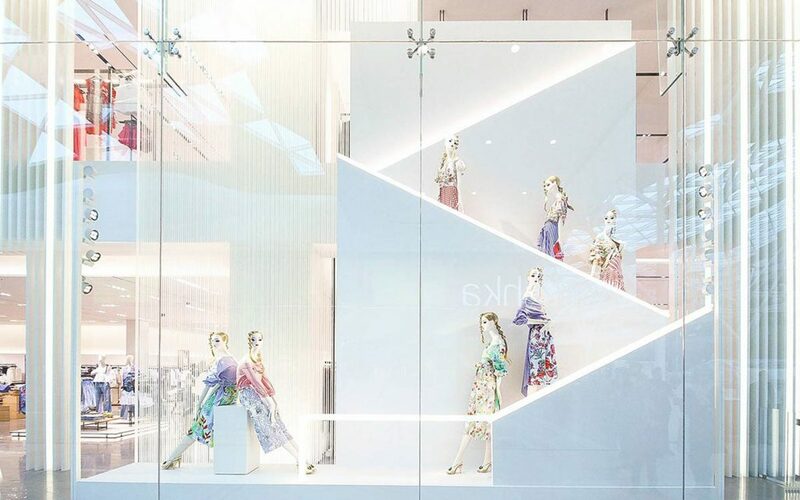 Zara tested their new-look interiors in this space before rolling it out across Europe. 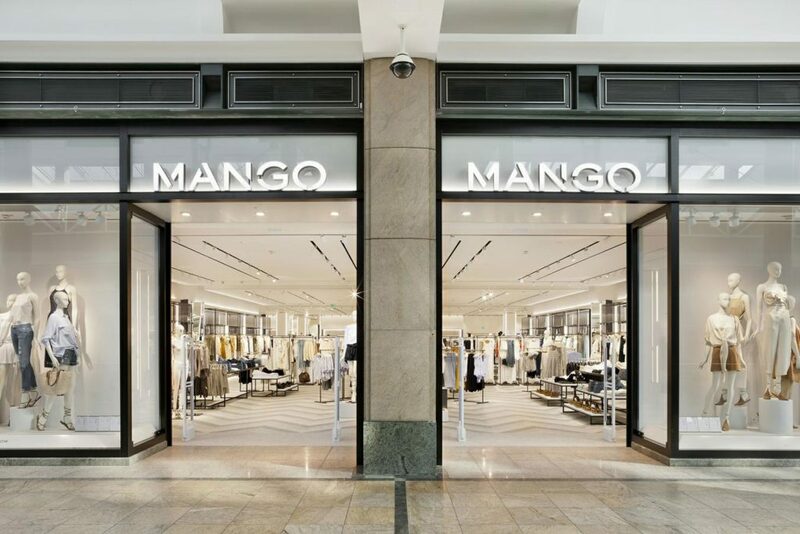 Located within the Westfield White City shopping centre in west London, this is the brand’s flagship UK store. 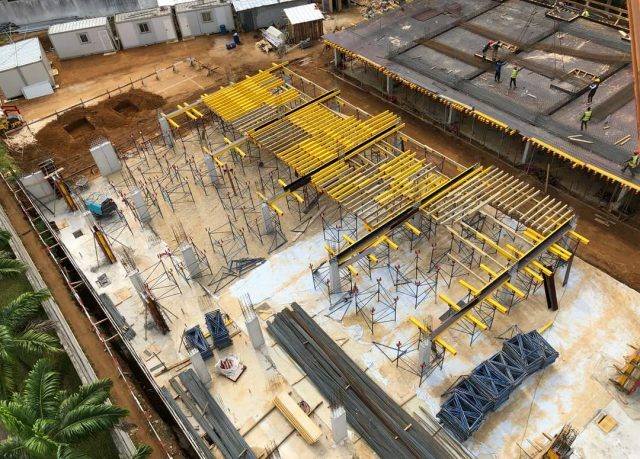 As well as complex negotiations with the landlord, Dos Management oversee all aspects of the build, including coordination with main contractor and all sub-contractors, obtaining all statutory permits and overseeing the Health & Safety aspect of the project. 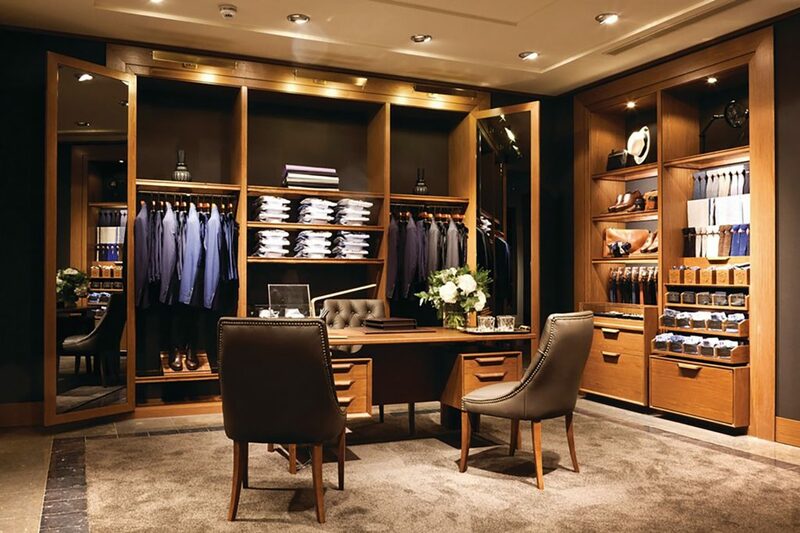 The largest Massimo Dutti in the U.K., it is located in a listed building owned by the Crown Estates in Regent Street, London: complex negotiations, very stringent planning restrictions and landlord conditions. Dos Management ensured a successful, on-schedule build. The first project for the Dos Management team in Brighton. 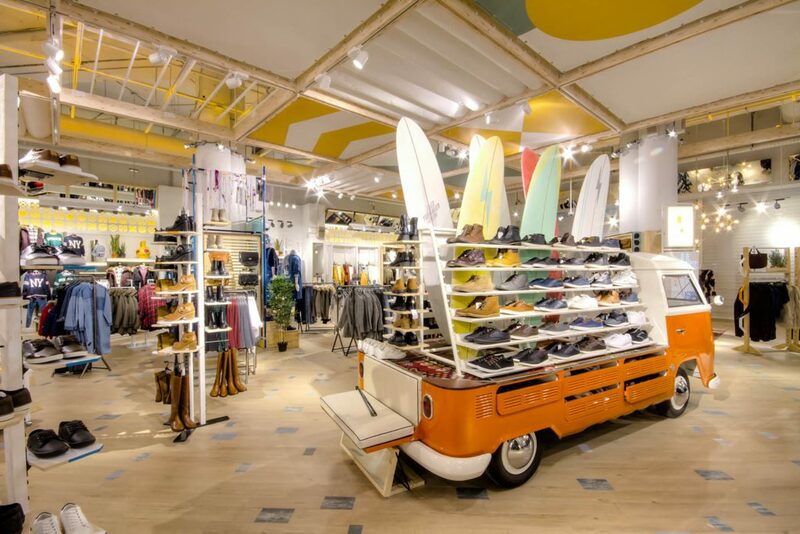 Pull & Bear used this retail space to test their new interior look, before roll-out across Europe. 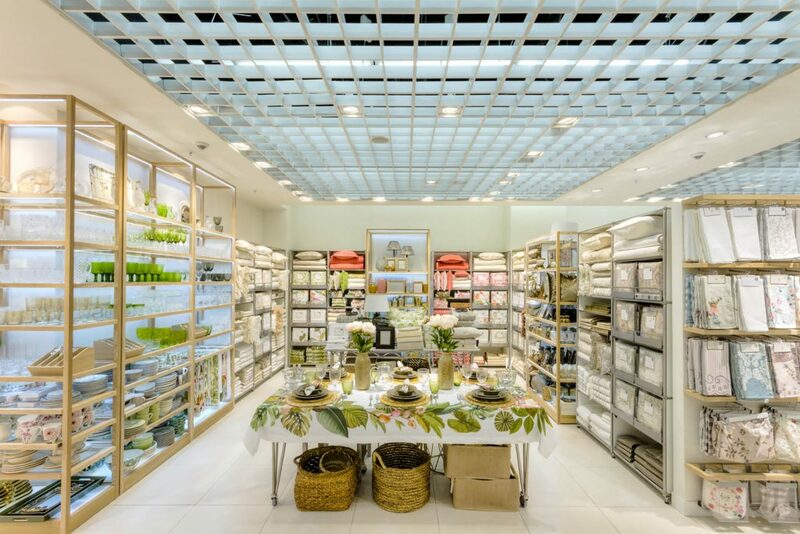 This Zara Home in the Westfield shopping centre in White City, London is the largest the UK. Dos Management turned it around successfully on an extremely tight 8-week schedule from start to finish, including negotiations with contractors and stringent restrictions from the landlord. Located in a listed building of historic importance on the Cadogan Estate in the heart of Chelsea, London, this site has very tight restrictions from the landlord and neighbouring residents. 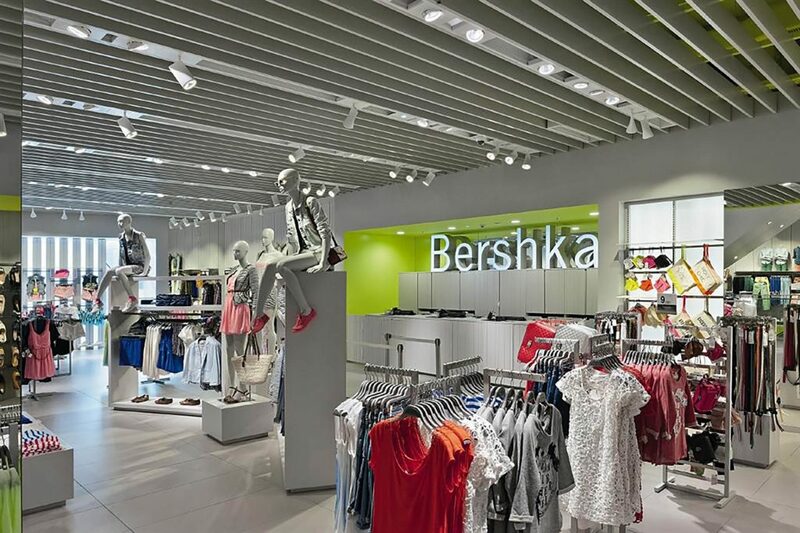 As a result, Zara had to retain many of the internal period features, which were highlighted and celebrated in the overall design, resulting in a truly unique shop. 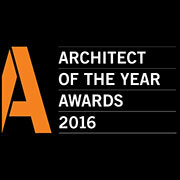 Shortlisted BD Young Architect of the Year Award. 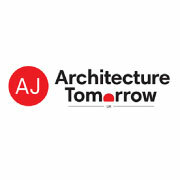 Selected for Architecture Tomorrow Gallery MIPIM. Competition winner. Lize Financial District Tower, Beijing. Shortlisted Guerrilla Tactics Live Pitch. Competition winner. Catholic Church of the Transfiguration, Lagos. Longlisted BD Young Architect of the Year. Competition Winner. Eternity Tower, Dubai. Our philosophy extends to the people we work with and our own organisations’ culture. 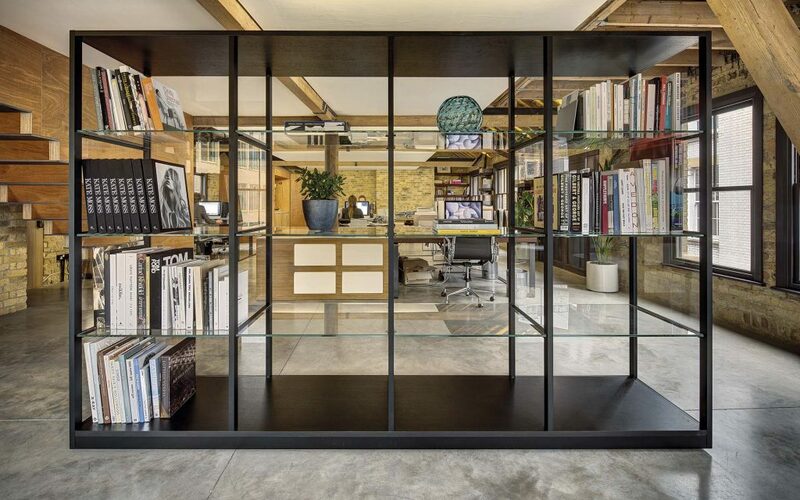 Based in Clerkenwell, East London, partners Tavis Wright and Lorenzo Grifantini previously worked for starchitects including Zaha Hadid, Philippe Starck, Ron Arad and Make Architects before meeting at Foster & Partners and deciding to choose their own path. DOS was formed in 2006 when they joined and won a competition to build a 90-storey tower in Dubai.